What is the PCT Program? In the last two decades, training has proved to be crucial. It requires skills, knowledge, and application in order to encourage companies and individuals to examine the training’s effect on performance. Today, full-time dedicated trainers and executive managers require technical logistic support more than ever. 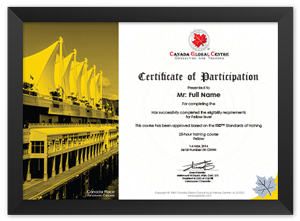 Therefore, Canada Global Centre in Vancouver/British Columbia has developed the PCT program which aims at offering this kind of service to trainees worldwide especially in fields of marketing and sales. Thus, the program forms a global team of trainers capable of exchanging techniques, skills, and experience – all based on the features, measures, and principals of CGC®. The Professional Certified Trainer (PCT™) Program grants trainers an international membership to help them pave their way towards professionalism. 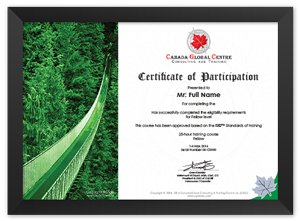 Trainers are issued a professional membership to join Canada Global Center’s trainers team to enjoy all its privileges including: using the PCT™ Program logo, approving their courses by PCT™, and issuing their trainees CGC® certificates. The PCT™ Program thrives to share expertise and skills with trainers through a participatory method in which each certified trainer may train his/her fellow trainers and - in turn - receive training from international trainers around the world. • Acknowledgement and credibility from one of the most innovative training centres in Canada. • Annual membership with the PCT program, renewable free-of-charge for active members who achieved the 100-trainees milestone under the supervision of the PCT program. 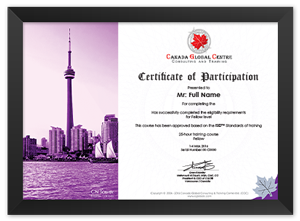 • Certificate of the Professional Certified Trainer authorized from Canada Global Centre directly. • Official contract from CGC® allowing you to train within the protocol and guideline of CGC®. • Official Professional Certified Trainer pin. • Personal custom-made membership card with your membership number. • Technical and administrative support compatible with your schedule and work agenda. • Enrollment in our ever-growing trainers list whether it’s on our website or in other publications. • Awards and trophies from the PCT program for reaching different milestones in your training career. • Marketing and financial support to publish your courses and training packages in the market (separate agreement is required). • The ability to use the PCT logo on your brochures, handouts, and business card; as well as to use the phrase “Certified from CGC®” (applicable after signing the Cooperation Protocol). • Professional follow-up to elevate and improve the membership level. • Free membership with www.CGC-Training.com, the online training website from CGC®, which introduces the trainer along with his/her specialty andtraining agenda. • The trainer has successfully completed the PCT™ Trainers Test. The above standards are aimed to raise the efficiency of trainers to meet PCT™’s proficiency level. The above standards are aimed to raise the efficiency of trainers to meet PCT™’s proficiency level. • Calculating the points in the table ( Basic Measures to Evaluate ) and meeting a minimum of 100 points. • Completing the Application Form of the PCTTM program. • Enclosingthe trainer’s CV or Resume, providing details for the educational level, the practical experience, and the training experience, in addition to any other skills, research, or achievements obtained by the trainer. • all documents shall be sent to the e-mail address of the program: PCT@CglobalC.com . • Please note that this phase is free-of-charge.The centre has the right to reject or deny any application forms that are based on false or fraudulent documents and/or false information. • The centre reserves the right to keep any paid fees up to that point. • The application is evaluated free-of-charge by the administration team of CGC® through reviewing the received documents and confirming whether the trainer has acquired at least 100 points in the points system. • An official response is due within one week from the day CGC® receives the application – the application may be accepted, placed on hold if more points are needed, or referred for testing. • The date and place for the Training Qualification Test are set, if applicable; and the testing fee due payable to CGC®. • For applicants who passed the Training Qualification Test, the official test score will be sent to the applicant along with an invitation to finalize the application process. • The test may be repeated free-of-charge within one month from the testing date for those applicants who did not pass the test. • Once the applicant fulfills all the necessary requirements, CGC will issue the applicant an approval confirmation; the applicant must sign the Cooperation Protocol and send it directly to CGC®. • The membership fees plus courier fees – are due and payable to CGC® upon signing the contract (an electronic confirmation copy of the payment is required and must be emailed to CGC®). 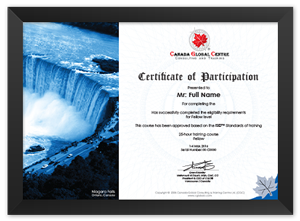 • Official PCTTM Certificate is sent within one week of completing phase three. • Copy of the Cooperation Protocol – signed by CGC® – is enclosed. • Official receipt of payment is enclosed. • Official PCTTM pin is sent and can be used by the trainer during the training sessions. • Personal custom-made membership card with your membership number is enclosed in the welcoming package. A method of calculating achievements points was designed to evaluate members of the PCT™ Program. Trainers who wish to join the program may calculate their points in order to acknowledge where they stand and to know how to enhance their points total before the final assessment is conducted and without having to take the PCT™ Trainers Test. You may calculate your points by yourself or seek the assistance from one of our centers to get help and advice on how to increase your points total. When you collect 100 points or more, you will be qualified to join the PCT™ Program. Otherwise, you may get in touch with PCT™’s administrative team to arrange for the PCT™ Trainers Test. Please note that the total points achieved, along with other vocational standards, will be used later on to classify the trainer’s level. Since 1995 until today, our training experts continue to work hard to fine-tune the classification system of professional trainers. Classifying trainers into three main levels – and few sublevels – is an effective method to guarantee the minimum level of information and knowledge of our PCT trainers. Although the classification method took into consideration several practical measures, it’s considered to be a close estimate of the actual performance of the trainer, even though such performance cannot be easily measured. Moreover, this classification does not indicate priority or adequacy among the different levels; instead, it’s a record of achievements before and during the membership with the PCTTM program. Listed below are the main factors CGC® takes into consideration when classifying trainers: Based on the aforementioned factors, we classify our PCT trainers in the following manner: Please note that PCT members may apply to advance to the next level as long as they remained at their current level for at least 6 months. The application will be taken into consideration and evaluated based on the advancement guide inthe PCT program. The PCT™ Program contributes in directing and developing the training field taking into consideration that several various expertise exist in different countries around the world which pave the path to new ideas and enable ambitious generations to transfer knowledge and experience. The PCT™ Program seeks to raise the potentials of its trainers as partners of its success and appreciates their contribution in enhancing training quality. The PCT™ Program honors those who made initiatives and developmental achievements in their fields in order to promote the concept of business community development in organizations. Catch the opportunities that hide away somewhere, just like.. how sail catches wind and pushes the ship forward. Be open and get ready to run with the wind. Life is a bridge between fears and dreams. Cross it with hope, courage, and absoulutely no fears. Set your sights high and put your goals into action. If you are so ambitious then stars aren't too high. You may crash down at some point; your life may have some ups and downs. Be like water, continue to flow. What history is but heaps of decisions? Design your future life tody with the.. right decisions. Q1: What are the requirements that enable you to grant Certificates of trainees CGC? Test does not focus on the theoretical component of training; instead, itemphasizes crucial key elements needed in the training field. The test is not designed to test the trainer’s knowledge as much as it focuses onthe training concepts and the trainer’s ability to employ such concepts. To guarantee the success of the applicant, CGC® strongly recommendsexamining and understanding the widely-available materials and books regardingTraining of Trainers. Such materials will cover all aspects of the testensuring the trainer’s success. The testing session will be supervised by aone of our authorized centers orcertified trainers. The duration of the test is 3 hours, 2½ hours for the written part and 30 minutesfor the oral interview. The test consists of 25 multiple-choice questions and 5 essay questions. The maximum score of the test is 22 marks. Q2: What are the foundations on which it depends proficiency testing training for Trainers PCT™ ? Accreditation and Certification of Courses, Trainers, & Trainees from CGC® Get to know your fellow trainers and trainees You can now contact the PCT™ administration team directly to inquire about: PCT™ program and their training schedules. PCT™ accredited andcertified course around the world.Theauthenticity of any PCT™ certificate issued by CGC®. Q3: Is there something that brings trained periodically to constant updates on the Training ground? The Annual Forum for PCT™ Trainers Development This one-day annual forum is based on an openinvitation to all PCT™ trainers around the world. It’s designed to discuss the latest andgreatest in the training field including new training methods and tools as wellas transferring critical skills needed in the profession. This forum will alsoserve as a recognition spotlight by celebrating our new members and recognizingthe achievements and milestones of our dedicated team through granting awards,medals, and certificates. If your centre is interested in hosting one ofour annual forums, please contact us to discuss further details. Q4:Can I get CGC’s certificates authenticated by Canada Foreign Ministry and my Embassy? 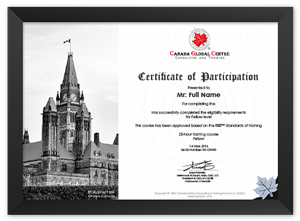 Through this service, you can get your training certificates authenticated through Foreign Affairs and International Trade Canada (Foreign Affairs Ministry) followed by an authentication of an embassy of your choic.